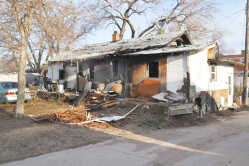 The City of McCook is weighing its options regarding a fire-damaged home. McCOOK, Neb. — The McCook City Council mulled over Monday night the best way to handle a damaged, abandoned alley house damaged by fire. The owner of the home at 1107 W. Fourth has been difficult to locate recently, said city attorney Nate Mustion. Based on prior conversations, family representatives do not have the funds to demolish the structure and the owner is not willing to sell, said City Manager, Nate Schneider. “It’s a unique situation,” Schneider said, adding that there have been issues in the past about the property with nuisance abatement. McCook Police Chief Ike Brown said the city has been dealing with the family from four to five years about a number of property issues and have “demonstrated an unwillingness to work with us.” The structure in question is impossible to secure due to the damage, Brown said. The structure is unsafe for a number of reasons, said McCook City Fire Chief Marc Harpham. That includes a partially missing roof that allows snow and rain inside, burned-out floor joists and a basement visible through the crumbling foundation. Schneider said as the property is unable to be secured, the staff is concerned that children or others could gain access to the structure. There is already evidence that people have been inside, Mustion said. Officials have considered using ACE funds, traditionally usually reserved for community betterment purposes, to demolish and remove the structure, Schneider said, and if these funds are used, the property owner would be required to deed the property to the city, free of cost, for demolishing and removing it. “I’m sure the neighbors would see it as community betterment,” noted council member Bruce McDowell. Agreeing that the situation was unique, councilman Jerry Calvin was concerned that by using ACE funds, it would set a bad precedent. Some property owners could see it as a way to not maintain their property and just let the city take care of their dilapidated premises. Schneider said the city handles each situation differently, based on circumstances. Previously, funds were reserved in the city budget for demolition, but this was discontinued the past few years due to budget constraints, he said. Other revenue sources he noted were federal neighborhood stabilization funds in 2009-10 that were used to take care of four to five structures in the city. Council member Janet Hepp said the city is looking at two issues in this situation, taking possession of the property and how to pay for demolition. Councilman McDowell said another revenue option the city has is to use council contingency funds, that are funds set in a reserve account. After discussion, it was determined that city staff would bring back an action item for the council at a future meeting, concerning the next step in this situation and how to pay for it.